If you are going to have Grievous kill his own droids because it was cannon, then keep this too. Would you mind providing the source for that, is this a cannon source? Also, that specifically says jedi, they ate not giving this ability to a jedi, so that description may not apply. Jedi or dark jedi it's the same. Prerequisite means a jedi needs to use it and by that a "force user". But it still says it's a dark side power. Like mace windu is a light side jedi who used the dark side of the force. But yeah if fear is in this game they need to make droids immune. Give Darth revan a proper counter and make general grevious rework worth more. It’s not cannon because nothing from KOTOR is, but it was the description for the dead force ability in game. It says Jedi, but it really just means force user, because fear is a dark side only force power. If lore mattered that much droids wouldn't get plagued by NS. 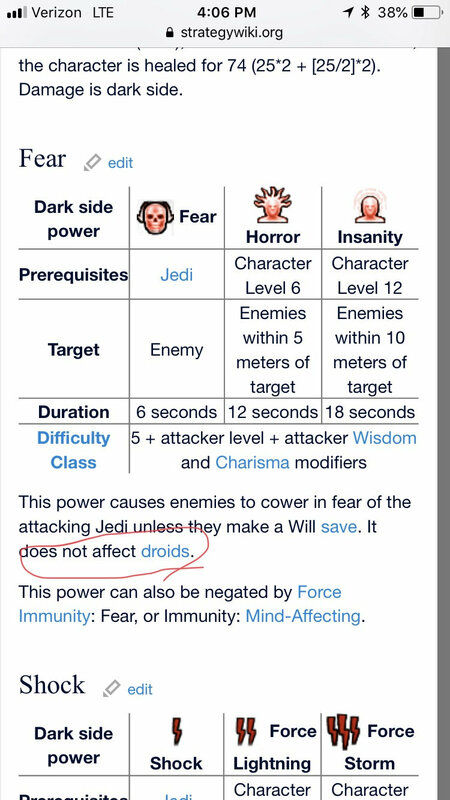 If anything, they might add to a droid leader something along the lines "droids are immune to fear, plague, etc" in the future, but it's highly unlikely to give DR an ability worded "...and inflict fear on enemies, except droids". Game is already complex. If it doesn't hold on defense it is not worth setting up. User Droideka has high level droids and is not ready for Darth Revan. User Jellyglob is ready for Darth Revan but doesn't have high level droids. Everything is speculation but from reading DR description it doesn't look like it holds on defense.